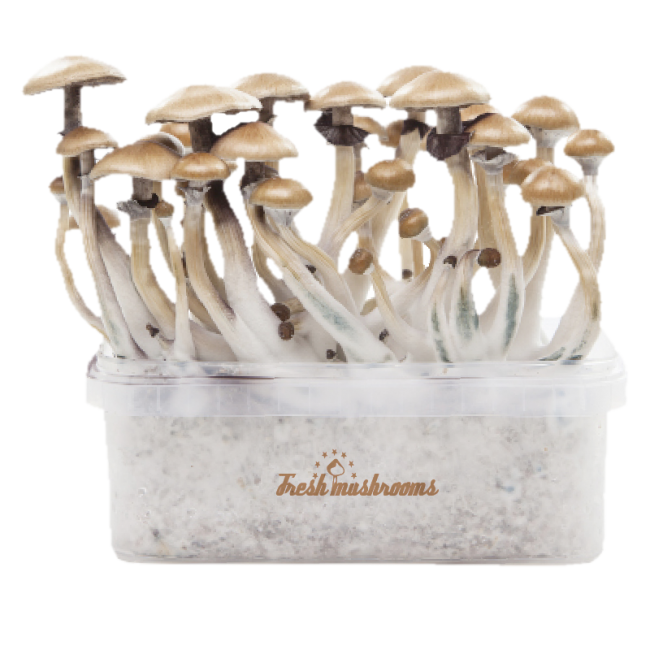 You want to buy more than one magic mushroom grow kit by FreshMushrooms®? Order a Magic Mushroom Grow Kits package deal and get a huge discount! 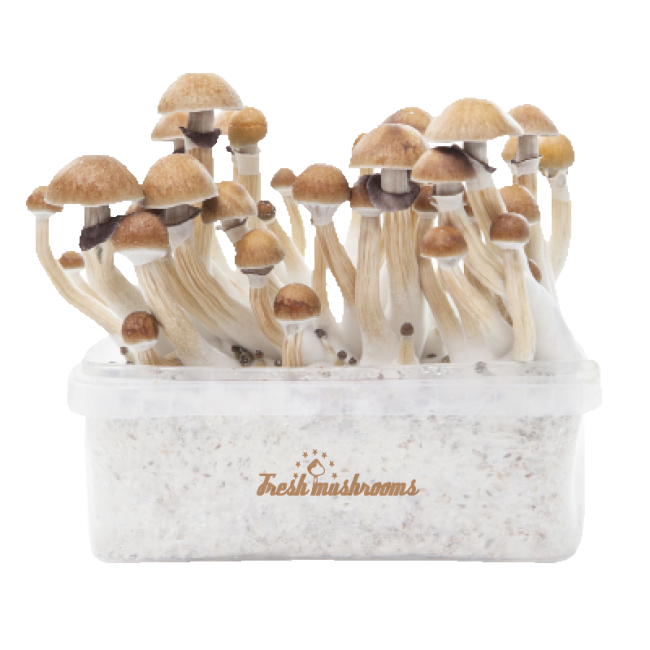 You choose your own FreshMushrooms® grow kits. You want to choose five the same? You can! Or maybe a few different FreshMushrooms® grow kits? do it! Order for yourself and your friends. Mix and match your FreshMushrooms® grow kits today. 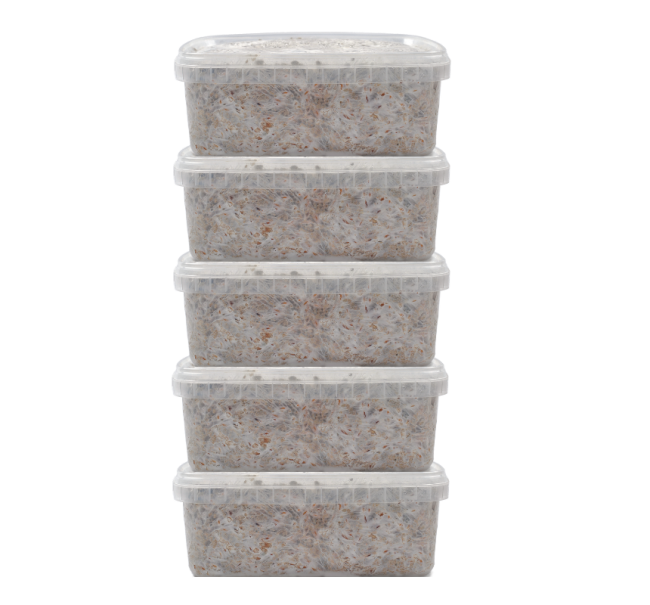 Growing with the XP Fresh Mushrooms Grow Kits is extremely easy. These kits are completely maintenance-free thanks to a fully colonized substrate without fillers. You hardly have to do anything to get your first flush with high levels of psilocin. Follow the instructions below and you will be assured a high harvest of mushrooms! Why choose a FreshMushroom Grow kit ? 1. Take the magic mushroom grow kit, plastic bag and paperclip out of the box. Remove the lid of the mushroom grow kit (store the lid properly). Rinse the lid under running water. You will need it again later (step 7). 2.Place the mushroom grow kit without lid in the plastic grow bag (opening at the top). Slide the opening of the bag under the bottom with the micro perforation pointing upwards. The opening of the bag is now largely closed. You do not have to worry about air circulation. 3. When you see the first small mushrooms ( called pins), you can put the grow bag upright. Do not water! The first magic mushrooms will be visible after about 1 week. 4. Place the mushroom grow kit in an area with enough daylight and at a temperature between 18 °C and 28 °C. NEVER place the grow kit in direct sunlight. Although mushrooms will grow at almost any temperature above 15 °C, 23 °C is the ideal temperature for an optimal harvest. Special heat mats are available to ensure this temperature and not have to heat the entire room. 5. When the mushrooms are slightly bigger as the pins keep the bag a bit open the entire time so the moisture can evaporate (Phase 2). Too much moisture is not good. 6.These kits can produce several mushroom harvests. To do so, fill the kit with clean tap water after the first harvest. This process is known as cold shock. 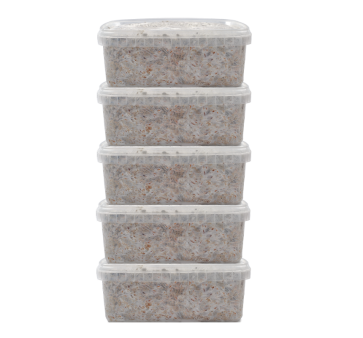 It breathes new life into the mycelium and ensures that enough moisture is present for the mushrooms to grow. 7. Place the lid of the grow Kit back on the kit. Let the kit rest for 12 hours. Open a corner of the lid and drain the excess water. From here you can follow the instructions from step 1 again. This process can be repeated several times. Place the plastic bag with the Grow Kit in it on the heat mat. Make sure ther is enough room for the airflow on all sides of the heating mat. Or use a thremosat to set a temperature. Switch the heat mat on. After two days switch the heat mat off and wait until the buds have developed, which usually takes between five and ten days. Switch the heat mat on again and open the top of the bag a little so the moisture can evaporate. * Advise from FreshMushroom producer. We recommend not to touch the kit at all. If the conditions are optimal, you can expect the first small mushrooms (the pins) to appear between 7 and 10 days. This also depends on the strain. Some cubensis strains grow slower than others. The mushrooms come up in groups. This can be a small or large group. That depends on the strain. A growth like this is called a flush. You can get more than one flush out of a kit. The first two flushes are the largest. When more flushes come, they will be smaller than the previous one. A flush of mushrooms are almost never ripe at the same time. The Magic Mushrooms are ripe and should be picked when the veil between the hat and the stem has just torn (or just before) Don’t wait much longer. Only pick the mushrooms that are ripe and let the others continue to grow. The mushrooms can easily be pulled out of the cake by holding them between thumb and index finger. When you prepare a kit for a next flush also pick the smaller mushrooms and the pins as well. Take the grow box out of the bag and place it upside down on your other hand. Wiggle the plastic box so that the cake will fall out, onto your hand. The plastic box can be placed on a disinfectant surface. Now you have this hand free to pick the mushrooms from the sides of the cake. 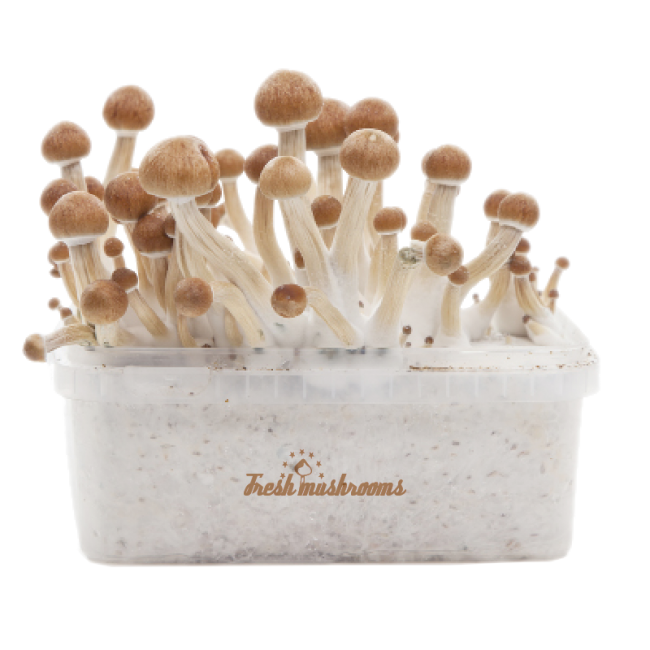 When all mushrooms are picked, you can place the cake back as it was, in the plastic box and continue to the soaking process. 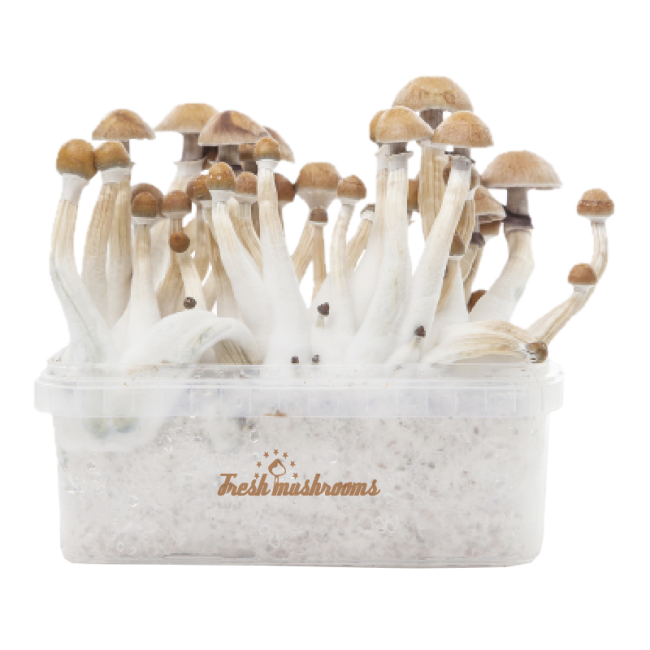 When no more mushrooms grow out of a grow kit after the second flush for at least three weeks, or when the Magic Mushroom grow kit turns green, red, grey or yellow; the grow kit can be disposed of. The change in color is a sign that the grow kit is contaminated with another fungus or a bacteria. 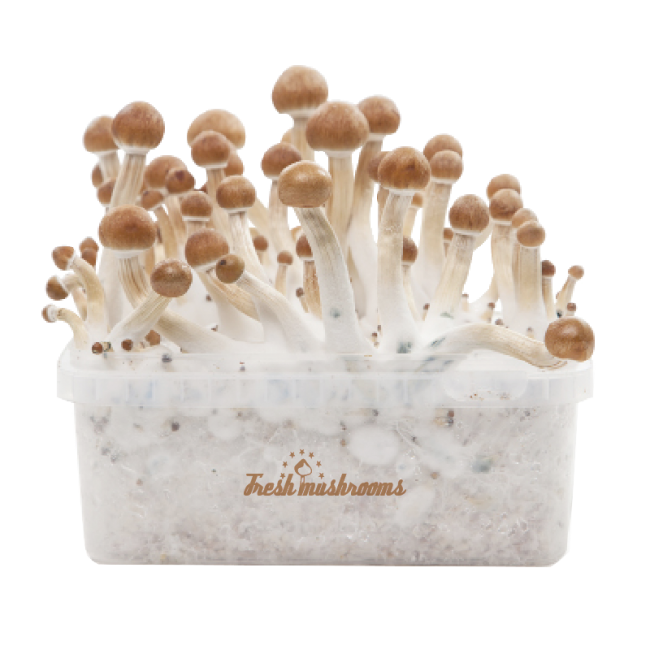 No more mushrooms will grow out of the Psilocybe cubensis Magic mushroom grow kit and the grow kit should be thrown away in the garbage outside. When you are too late picking the mushrooms, they will drop their Magic Mushroom Spores . The cake and the mushrooms will turn black/purple (some other cubensis strains red/brown) because of the spores. This is not really a problem; it just doesn’t look very pretty. When mushrooms release their spores, they also start to degrade and the active ingredients are breaking down. Mushrooms will lose some of their potency. The kits are very simple to set up and maintain. The mushrooms grow quickly and plentiful for a couple of flushes. Nice and easy to use just how i like it...support team are there to help which they did in my case. The mushroom grow kits arrived,along with my other products, except my face mask and sterile gloves but I was compensated which I am very greatfull , they all Arrived in perfect condition. Me being new to mycology I was anxious to get started, luckily due to the quality of the product I had my first pins in the first week, except from my mexican mushrooms they took abit longer to pin and I believe it's because of the strain not because of the quality. Great product, fast shipping, easy site to use, great fast support.